What is The Circle Way process? 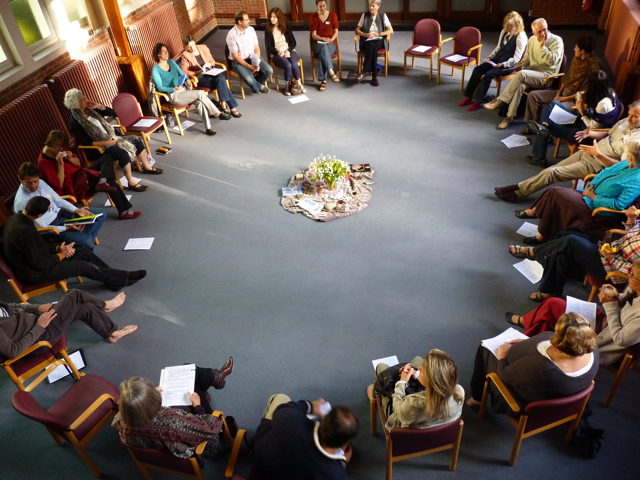 The Circle Way gathers people into a circular shape with participants at the rim and the purpose in the centre. Each person has a voice and everyone can see and hear one another. Social agreements and practices help facilitate respectful conversation. Circle supports a leader in every chair. Manitonquat Medicine Story’s Circle Way emphasizes practices and resources that use circle to develop clear communication within the self, the home/family, and the community. To see more of this work, please go to www.circleway.org. You can also learn about some other circle lineages here. The Circle Way represented on this website, streams from the life work and writings of Christina Baldwin and Ann Linnea, and is now held as a global network here at www.thecircleway.net. Our focus is to mainstream circle as a collaborative shift in the operating systems of the modern world; to change how organizations and communities function and work together. Please read below to learn more. How do I learn more about The Circle Way? If you’re new to The Circle Way, start here for a more in-depth description. Read the book, access resources, find out where you can take training, and meet the people doing the training. Don’t be afraid to try this at home! Will The Circle Way work where I work? Even within hierarchy, The Circle Way works. Bringing people from all levels to sit as co-leaders in the circle leads to wise decisions and actions. Circle practice is highly successful in business environments, non-profits/NGOs, community organizations, schools, universities, and faith communities. Will The Circle Way work where I live? The Circle Way provides a slightly more formalized conversation process when people need to speak and listen to one another carefully. Circle assists families, friends, and communities in moments of transition and life celebrations. Circle deepens communication of the heart. How is The Circle Way being used? Discover stories about how people are using The Circle Way and adapting its practices to their environments. Learn from community builders in Zimbabwe, teachers in Canada, leadership consultants in Germany, nuns in the United States, and many others.